Bella was born in the mind of Mandy Stanley, who originally trained for a career in the fashion industry creating baby wear. Now that I'm aware of that, I can see her love of children and babies in the way that she has illustrated this little rabbit. 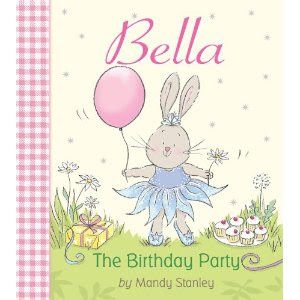 I opened up a box from Tiger Tales Publishers and inside I found Bella: The Birthday Party . Before I had even opened up the cover of the book, my heart was sold! There is something about the pink gingham and the sparkling fairy dress that Bella is wearing. I knew I was going to LOVE it! And I was right. "Every day was the same, until one summer afternoon . . ."
Bella meets a little girl who is chasing a balloon. It is the girl's birthday and she invites Bella to join in the party. Bella has a wonderful time playing with the children but soon it starts to rain. The little girl begins to cry, believing her party to be ruined. This is when Bella comes in and saves the day by taking the children to a "beautiful secret spot" that is a magical looking place. The children feast on cake and Bella is heralded as having saved the day! Bella is sent back home with a bag of treats to share with her family and a bunny balloon all for herself. Could this book possibly BE any cuter? I think not. "Nibble, nibble. Hop, hop. Every day was the same, until one summer afternoon . . ."
Bella is making a daisy chain when she feels the sharp tug of a fairy on the other end. Off she goes to spend some time with fairies. 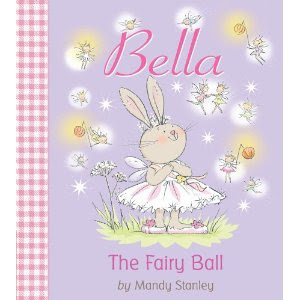 The fairies like Bella and sprinkle golden fairy dust on her to make her tiny, just like them. She has a delightful day with the fairies and then is sent home again with the gift of one wish that they promise will come true. What is Bella's wish? Well, you'll just have to read the books to find out! I think these books are awesome and adorable. (Insert: gush, gush, gush!) I like Bella. I like Bella a lot. Someone needs to loan me a little girl to read to and play with for a bit, me thinks! In the meantime, the best I can do is offer a giveaway to one of you (assuming you have a girl, or know of one) that you would like to share these with. Tiger Tales has very generously offered a set of these two books to one Reading to Know reader. All you have to do is leave a comment below. This contest will be open through Thursday, July 8th. It is open to U.S. Residents only. Best fairy wishes to you! These books look fabulous! I wish I would have known about them before my 4-year old daughter's birthday. Oh well...will keep them on a list for a future gifting for her. I have an almost 4 year old girlie I would loan to you for play dates if it wasn't so far from my house to yours. I'm sure she would like these books as she is VERY imaginative and likes bunnies. Absolutely adorable!!! I'd love to win these! My 4yr old would be over the moon for these. Somehow, even with 3 older brothers, she is a super girly-girl. Well, kind of, she can often be found digging in the dirt wearing her princess dress; is that still girly-girl? Adorable! Thanks for the chance to win them! My granddaughter would love these books—please enter me to win! Sound like great books. My daughter would love them! These are cute books! I've already given a set of them as a gift, and I certainly wouldn't mind doing the same with another set, since my daughter is just a little old for them. These book look so cute. I'd love to win them for my daughter. I would love to get these for my neice! I hope to win! Thanks for the giveaway! My daugher BELLA would just love to win these books!! My daughter has been wanting some new books to read over summer vacation. I hope I win these for her. She would love it! First, you can take your pick of any 3 of my gorgeous grandbebe girls, only I'd have to come with you, or their moms would have HUGE tantrums! They love Gigi Read to Me Storytime and these books would be awesome! Thanks for the chance to win! I would love to read these with my daughter!! These would be terrific for my DIL's niece. Would love to add these to my collection! Oh, I want I want!!! I know my daughter would love these books. Hoping I win, but if not these are going our library list ASAP. We have read the Lettus books from the library and love the bunny. She is so girly! What cute books! Bunnies, fairies, and parties? I love it. Thanks for offering the giveaway.